Made in the heart of New York! 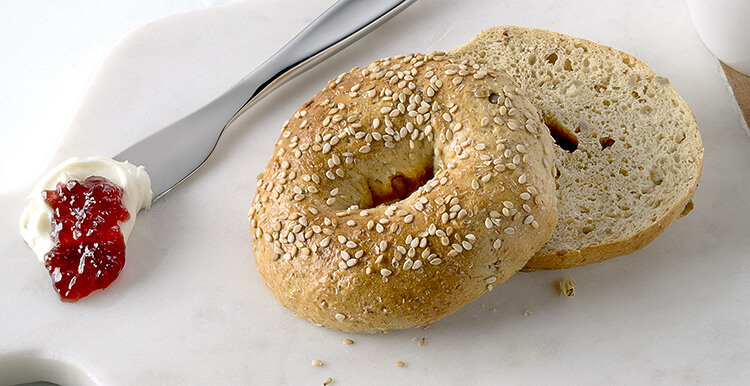 Kickstart your morning with a multi-grain bagel topped with sesame seeds, making it an energizing start to the day. Ingredients: FLOUR (WHEAT FLOUR, MALTED BARLEY FLOUR), WATER, SUGAR, CRACKED WHEAT, ROLLED OATS, OAT FIBER, SUNFLOWER KERNELS, WHOLE WHEAT FLOUR, AND LESS THAN 2% OF WHEAT BRAN, WHEAT GLUTEN, SALT, WHEAT FLOUR, SESAME SEEDS, YEAST, MOLASSES, VINEGAR, CULTURED WHEAT STARCH, ENZYMES, MALTED BARLEY FLOUR, ASCORBIC ACID, CORN PROTEIN, SOYBEAN OIL. Nutrients: FLOUR (WHEAT FLOUR, MALTED BARLEY FLOUR), WATER, SUGAR, CRACKED WHEAT, ROLLED OATS, OAT FIBER, SUNFLOWER KERNELS, WHOLE WHEAT FLOUR, AND LESS THAN 2% OF WHEAT BRAN, WHEAT GLUTEN, SALT, WHEAT FLOUR, SESAME SEEDS, YEAST, MOLASSES, VINEGAR, CULTURED WHEAT STARCH, ENZYMES, MALTED BARLEY FLOUR, ASCORBIC ACID, CORN PROTEIN, SOYBEAN OIL.